When you step into Lasting Brass Brewing Co.’s tasting room in Waterbury, the brewer himself pours from the taps. This kind of personalized experience extends to the tour itself. As you navigate your way past the grain sacks and gawk at the Lasting Brass posters, brewer Ed Silva ushers you into the brew room. Next to six of the Lasting Brass display bottles, you get a chance to see the brewing vessels up close. This Town Plot brewery is gaining a lot of buzz from those in the know. And its Olde Colony Saison and Clock Tower Pale Ale might be flying off the shelves, except for one thing. Lasting Brass doesn’t exist. Not professionally, at least. 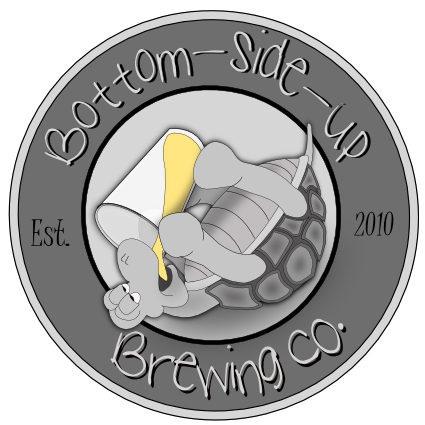 Neither does Bottom-Side-Up Brewing Co. in Vernon, but that’s not stopping these homebrewers from creating and marketing like pros. You’d be excused for thinking that Lasting Brass was a true brewery, what with the logos, the tap handles and the t-shirts. The social media presence is also persuasive; some of Silva’s 356 fans on Facebook post loving comments while several of his 120 Twitter followers brag about the latest Lasting Brass bottle they’d acquired. We sat at a small table in his ranch house, sipping his Brass City Blonde Ale, which is smooth with an orange-like bite. 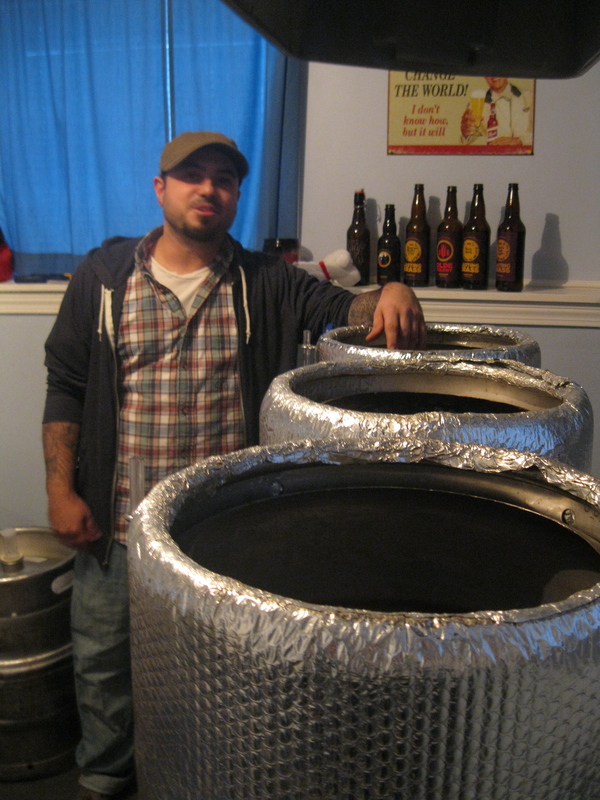 Silva, 34, makes his beer like most homebrewers: 10 gallons at a time from a space off of his living room. He uses three converted kegs arranged horizontally, powered by electricity. A bathroom a few feet from the kettles contains a bunch of glass fermenting vessels and small kegs. His wife’s cool with it. The UConn graduate who works in Danbury started making beer on a stovetop 10 years ago and, after brewing for friends and entering competitions, he’s garnered praise that’s spreading. Among his fans is Aron Daniels, who promotes Connecticut beer and is known among Twitter followers as “Craft Brew Guy.” After getting to know Silva while trading beers, Daniels invited him to share his creations at his “Craft Beer Revolution” brew fest last year. “I felt strongly that his beer was of superior quality and needed to be shared with a larger audience,” Daniels wrote in an email. Whatever Lasting Brass is, it certainly highlights Waterbury. The name Lasting Brass comes from a quote inscribed across Waterbury’s City Hall entrance: “What Is More Lasting Than Brass?” Along with his Brass City Blonde Ale, he makes Clocktower Pale Ale and a roasty, mellow porter named for the downtown Apothecary Building. “Waterbury made me who I am,” Silva said. The beers come with incredible artwork, created by designer friend Ben Callaghan, who creates “branding” for companies with Fathom LLC, in West Hartford. Callaghan volunteered for this side project because he loves his beers and identified with the brewer’s entrepreneurial spirit. Across the Connecticut River, Heath Gelinas of Vernon heads up a trio calling itself Bottom-Side-Up Brewing Co. Among the bottles available to friends and family include a maple imperial stout, an imperial stout made with chai tea added, and an India pale ale aged on cabernet-soaked oak chips for two years. Could this be the start of Connecticut’s underground boom of marketing-savvy homebrewers? With brewfests as showcases, I think it might be. This column was originally published in on Feb. 12, 2014, in the Waterbury (Conn.) Republican-American. This entry was posted in Beer Snob, Brewery and tagged Bottom-Side-Up Brewing, Lasting Brass Brewing, Waterbury. Bookmark the permalink.